(Jan.30, 2016) – Mr. Nguyen Anh Tuan, Chief Executive Officer of the Boston Global Forum shares his view on Global Citizenship Education which he believes would become one of important element to build sustainable peace and security in the Middle East. 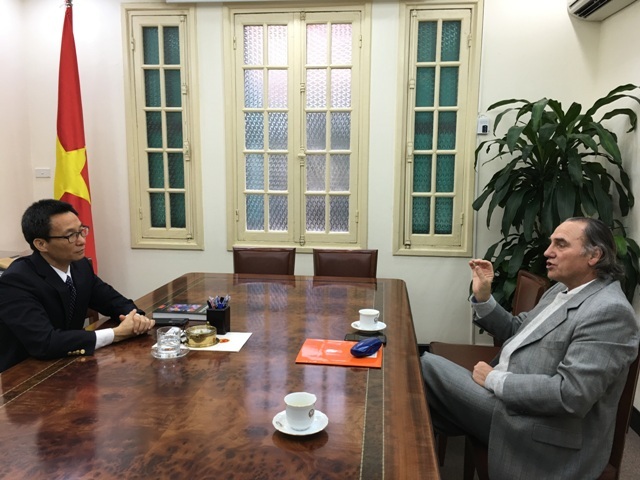 Dr. Carlos Alberto Torress, Chair of UNESCO-UCLA chair on Global Learning and Global Citizenship Education (GCE) discussed with Vietnam’s Deputy Prime Minister Vu Duc Dam about promoting the GCE in Vietnam. Read Mr. Nguyen’ statement below. The Boston Global Forum is gratified that U.N. Secretary General Ban Ki-moon supports the BGF’s Global Citizenship Education program. In 2006, when I was Chief Executive officer and Editor-in-chief of VietNamNet, I developed the idea of encouraging Vietnamese citizens to become global citizens. I believed that such a project would help Vietnam become a developed country. So I conducted a series of articles on global citizenship for VietNamNet. I have since come to believe that Global Citizenship Education could become one of the most important ways to build sustainable peace and security in the Middle East. Arrange for leaders of different religions – including Muslims, Christians, Jews, Buddhists and Hindus — to meet, talk and learn from each other as they discuss how to improve their fellow citizens’ lives, especially through education. The leaders should be encouraged to frequently resume their dialogues in order to continue to strengthen their mutual understanding over months and years. Make full use of technology, including the Internet and mobile phones, to organize the social networks that would provide a platform for Global Citizenship Education in the Mideast. Make Global Citizenship Education content very flexible and accessible. For instance, this might include developing learning games to introduce people to the program’s principle. Persuade the G7 nations to support Global Citizenship Education financially and otherwise to help develop peaceful, tolerant and prosperous civil societies, both for their intrinsic value for individual nations and to promote international peace and security. Nguyen Anh Tuan is currently the Chief Executive Officer of Boston Global Forum (BostonGlobalForum.org) and Chair of International Advisory Committee of UNESCO-UCLA Chair on Global Learning and Global Citizenship Education.